Sir William Harris is still best known for his anthem Faire is the Heaven, which sets parts of a poem by Edmund Spenser. But Harris�s catalogue includes a number of other pieces which deserve to be well known. Some ten years ago the Exon Singers under Andrew Carwood produced a disc of Harris�s choral music which brought it to our attention. Now Naxos have brought out a disc of Harris�s music sung by the Choir of St. George�s Chapel, Windsor, where Harris was musical director for nearly thirty years. Harris might have been an almost exact contemporary of Stravinsky, but his music contains little trace of modernism. He is a strong example of the late-Romantic English school, with his well-turned ear for word-setting, a fondness for good English poetry and a musical style that makes much of modulations. It is this latter which is his most distinguishing characteristic, his pieces rarely stay in a single key. He is adept at using chromatic modulations to enhance his projection of the text and to screw up the tension. Harris was also fond of using enharmonic changes as another tool in his finely wrought music. A prime example of this is Faire is the Heaven which starts and ends in D flat major, the key that Harris associates with the souls resting in the divine presence. But as things get interesting D flat is transformed into C sharp and we slip into A major and then onward and onward until D flat major is reached again at the end. The casual listener will probably be ignorant of the mechanics behind all this but the way Harris manipulates keys is a significant part of the music�s powerful effect. It also makes his larger-scale pieces tricky to sing well. Faire is the Heaven is the sort of well known piece that is easy to do indifferently and hard to do really well. The Choir of St. George�s Chapel set them selves a strong task by undertaking these large-scale Harris pieces. 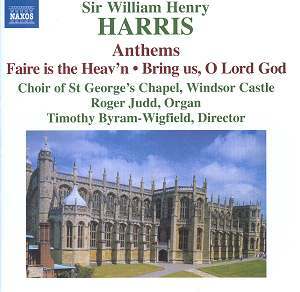 Faire is the Heaven was written for a choir consisting of eight parts and the Windsor choir has just four altos, four tenors and four basses. This means that there are just two men on each of the lower parts. This means that we are aware of individual voices. That the choir fails to blend into a shimmering whole is not necessarily a bad thing. It means that we are more aware of the different vocal lines and of the intricate part-writing in Harris�s more complex pieces. It helps that the choristers sing with passionate commitment. Harris�s music can be strong, meaty stuff and Timothy Byram-Wigfield and his choir obviously believe in it, and convey that belief to us. We may detect individual voices but they all imbue Harris�s vocal lines with shapeliness and project the words well. The result is that the choir has a very distinct personality which, in this age of bland homogenisation, is a good thing. Faire is the Heaven is preceded by another of Harris�s large-scale pieces, Strengthen ye the weak hands which was composed for the Commemoration of the Science and Art of Healing, so its texts are all chosen for their medical relevance. It is strong stuff indeed, well projected by St. George�s Chapel Choir and I hope their performance gains the work more admirers. Love of love and Light of light sets another English poet, Robert Bridges. It was written in 1935 in memoriam Robert Bridges and dedicated to the poet�s wife, Monica. In this piece Harris seems to hark back to Parry and in place of his usual explorations of remote keys, utilises Parry-like sequential patterns. The result has some wonderfully evocative cascading phrases. Another big piece, Praise the Lord O my soul was written in 1938. Initially rather understated, this piece gradually develops its material and produces some thrilling climaxes. The choir give it a wonderfully committed performance but there are a few smudgy details and at times their performance sounds a little too strenuous. Here and in one or two other places the trebles' tone can get a bit harsh under pressure. This slight harshness mars King of Glory, one of Harris�s simpler settings. Simpler it might be, but it is nonetheless an effective treatment of George Herbert�s text. Harris�s Thomas Browne setting, The Night is Come, was published in 1961, the year that he retired. This has a lovely haunted opening that evokes Browne�s text beautifully. Though it develops strenuously there are some beautiful moments of repose, notably the lovely setting of the words �Sleep is a death, O make me try by sleeping what is to die� and the calm, quiet closing pages with a lovely bass solo from James Birchall. The disc ends with the setting of another great English poet, John Donne. Bring us, O Lord God was written some thirty years after Faire is the Heaven but its harmonic explorations have much in common with the earlier work and make a fitting conclusion to this recital. Three of the pieces on the disc are world premi�re recordings. The CD booklet is written by Alastair Sampson, former organist of Eton College Chapel, who served as a chorister under Harris in the 1950s. Sampson�s notes are admirable, but they have the unfortunate tendency to refer to the works in an order different to that in which they are performed, which can be rather frustrating. This Naxos disc will, I hope, bring Sir William Harris�s work to the attention of a whole new audience. Not everyone will be comfortable with the choir�s choral style and I hope that future recordings may refine things. But they perform their old master�s music with passion, commitment and a remarkable degree of accuracy. What more could you want?